Since the race’s inception, The Kirste 5 has served as a beacon to the brave and bright life of Kirste Bowman, who died back in 2012, aged 42, after her continued battle with breast cancer. Kirste’s enduring legacy has been intensely felt every year through the scores of runners and supporters that have turned out to make the day a soaring success, raising money and awareness for Southend Hospital’s Breast Cancer Ward and MacMillan nurses in the process. On track to raise somewhere in the region of £6,000 – with record numbers in attendance – this year’s race once again proved testament to the event’s unshakeable resonance. 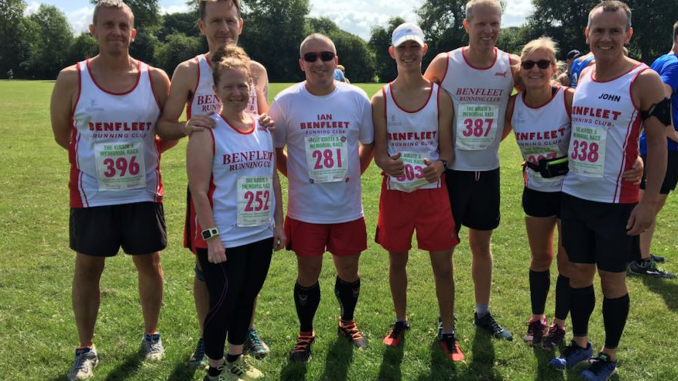 First Benfleet to finish was Eddy Cooper in 4th place with a time of 31:22, with Graham Booty trailing just behind in 5th place with a time of 31:53. John Robertson completed the course in 48:03, followed by Deborah Robertson in a time of 48:17. Lee Allen, Kevin Massey and Ian Caldwell finished in a time of 48:42, 50:25 and 52:13 consecutively. Brian and Samantha Venton both crossed the line in 54:11, followed by Morgan Reddish in 1:12:50. Ann and Paul Reed tackled the 24-hour Cotswold relay race, conquering 13 5.62 mile laps of the 9km course comprised of off-road trails and tarmac paths, finishing in 8th position in the age group, and 110th out of 326 teams overall.